The day after Betsy had her first proper meal was our annual street party. Inspired by some Waitrose sweet potato falafels I decided to apply my recipe to sweet potatoes for one of the side dishes. My best friend (and Betsy’s namesake) was holding Betsy in one hand and a falafel in the other. Betsy leaned over and plucked the sweet potato falafel from her hand and tucked in. An absolutely hilarious moment and 100% baby led weaning. Needless to say we fixed her up with her own falafels which you can see her eating in my baby led weaning video. Sweet potato falafels are a great picnic food and are a great veggie dish to have in your repertoire. I like to roll them in sesame seeds which are a good source of calcium and iron and as the sweet potatoes are high in vitamin C you know that iron is going to have the best chance of being absorbed. If you have reason to be cautious about allergens you may wish to leave them out – this won’t cause a problem. If in doubt talk to your health professionals for advice. Bake the sweet potatoes wrapped in tin foil in the oven for 30 – 45 minutes until they are soft all the way through. I often do this the night before when I’m cooking supper then let them dry out in the fridge overnight. Peel off the skin and mash the flesh in a bowl. If you have time let them dry out as it will give a nice texture but if you don’t have that luxury stir through the gram flour (chickpea flour) which will help soak up the excess moisture. Put the onion, coriander, parsley, garlic, cumin and cumin seeds into a food processor and whizz up until finely chopped. Stir the mixture through the sweet potato until well mixed. Roll the falafel into balls (size them to be easy for a baby to grasp). Lightly toast the sesame seeds in a frying pan over a medium flame. 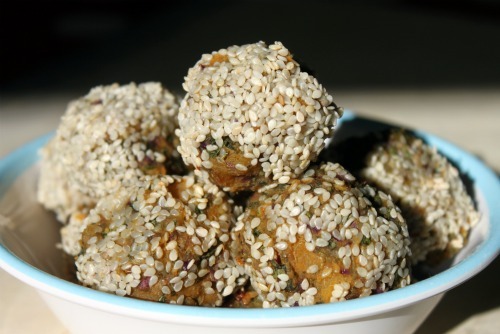 Put them on a plate then roll your falafels in the seeds. Lightly oil a baking tray, place your falafels on the tray and bake in the oven for 20 minutes. Serve with pitta, hummus and salad leaves or cucumber slices. Find more recipes for BLW in my Baby Led Weaning section and for all the family in Housewife Recipes. Funny, I bought some sweet potatoes last week and was wondering what I should do with them. They are currently in the oven, thanks! Looking forward to it. I did, my husband did but I couldn’t convince the children :-( Oh well, It’s another one for the veggie repetoir.